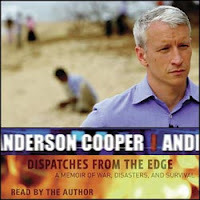 Last evening I finished up Anderson Cooper's Dispatches From The Edge. I must say this book touched me like no book has touched me in years. I remember reading Chinua Achebe's book in High School, Things Fall Apart and getting upset as I read on. By the time the book ended I was mad. I had truly connected with the story and was emotionally affected by it. Since that time I have rarely if ever really gotten that connected to a book... until this read. Last week I was sitting in a Taco Bell on my lunch break listening to chapters from this book on my Zune. I was sitting on the edge of my seat holding back tears as Cooper described the lives of people he encountered through his professional life as a journalist. I was sitting there eating a Crunch Wrap Supreme as he described the famine in Somalia and Niger and I suddenly lost my appetite. My food seemed somehow insignificant. Cooper writes that the act of moving on kept him going. He intermingles his stories from the field with the story of his life. Everything seems tragic; everything seems painful. He describes his original desire to immerse himself in the worst situations in the world as a way to surround himself in other people's pain and sorrow in the hopes of wrapping perspective around the tragedy and pain of his own life. In the end Cooper makes it clear that he used to think his stories might cause change to the world but now he believes they merely show an audience what is happening in the world instead of inspiring us to change it. From a news corespondent you hear on a regular basis the facts of stories and world events, hopefully unpolluted with bias. But from this book we really hear the opinion of a man who has seen many horrible things throughout a career. We see a man who has cried alone at night after watching men, women, and children dying of starvation in Africa. We see a man appalled by the death of Americans in the city streets of New Orleans with no government officials to clean up the bodies or save those clinging to life. We see a man who has held his tongue on his opinions out of duty to his profession who is full passion and pain. This book was a brilliant memoir. It is short and readable and I will never forget it. It will change the way I think about war, poverty, hunger, and foreign affairs. It will stay with me for years. I don't expect another book to touch me quite like this one for a very long time!